century. Born on Leap Day 1892, in Green Cove Springs, Florida, she came from a poor family of 13 children. So many children and little money left the children with no toys. But the creative spirit in her found a way; in her case it was the clay pit near their backyard. She created sculptures of animals and often skipped school to create her animals. Her father, a minister, did not approve of her creating “idolatry” of God’s creatures and often punished her for the creations. The South Florida connection emerges with the family’s move to West Palm Beach in 1907. That move, however, cut her off from her beloved clay. While on a school trip, she rode past a local business called “Chase Pottery” and she knew clay was there. She yelled for the wagon to stop and ran to the shop. The potter was so impressed with her excitement that he gave her three buckets of clay to take home. Her father still disapproved of her sculpting, but after seeing her sculpture of the Virgin Mary, he realized her talent and accepted her art. 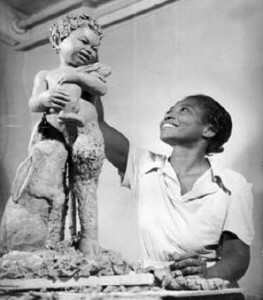 Several teachers at the school for Blacks also noticed her talent, and after graduation, she was asked to stay on as a teacher of art at the school for the salary of one dollar a day. She went on to study one year at Florida A&M University at the teacher’s college. Among those who noticed her talent was George Currie, a local leader who was an attorney, developer and had also served as mayor of West Palm Beach. Artistic talent was his too; he wrote several books of poetry. 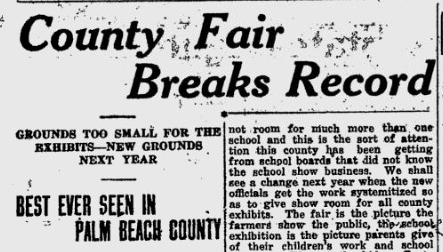 At that time, Currie was serving as the secretary of the Palm Beach County Fair, which was held near the train depot. 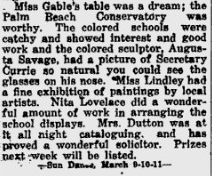 Over considerable objection from other fair officials, Savage was allowed to have her own display booth of her sculptures. Not only did she sell $175 in sculptures, she won a $25 prize at the fair. 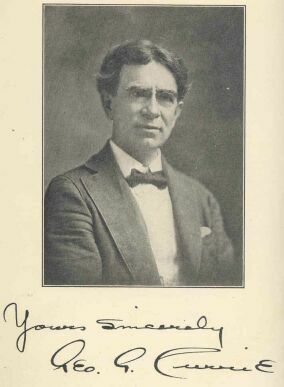 Currie knew her talent was there, so he helped her study in New York. With a letter of introduction from Currie to a sculptor he knew in New York, she studied at the Cooper Union, a tuition-free art school. She supported herself with a cleaning job, but the job was soon lost. The advisory board at the Cooper Union agreed to pay her board as they felt her talent so great. She applied for a summer art program in Paris, but was solely denied because she was Black. The story of her denial was carried in several papers, and artists came forward willing to have her study with them. 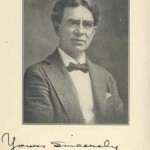 Among them was Hermon Atkins MacNeil. She continued her studies and supported her family through working in a laundry. Her family back in West Palm Beach soon had to join her as their home was destroyed in a hurricane. 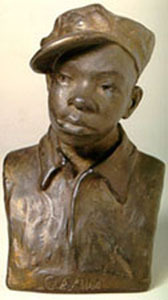 She received her first commission, a sculpture of W.E.B. DuBois to be done for the Harlem library in 1924. In 1925, she won a scholarship to an art school in Rome, but was unable to attend because it only covered tuition. Her dream of studying abroad was finally realized in 1929 when the Julius Rosenwald foundation funded her study at a leading Paris art school. She toured Europe as part of the experience, displaying her works along the way. her studio. 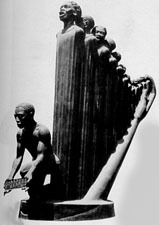 In 1939, she received a commission from the New York World’s Fair, and she created a sculpture entitled Lift Every Voice and Sing. The large sculpture was cast in plaster as she could not afford bronze. Small copies in metal were cast and sold as souveniers at the Fair. It proved to be one of the most popular attractions at the Fair. Unfortunately the plaster cast of the sculpture was destroyed after the fair as there was no money to preserve it. It was at this time that Savage abandoned her art career. She moved to upstate New York and only occasionally created new art. She rarely spoke of her career and worked at a mushroom farm. Occasionally she would teach an art class. As her health faltered, she moved in with her daughter in New Jersey. She died March 26, 1962.
talent may have never been realized. Today the few surviving pieces of her work sell for thousands of dollars. In this way, she has suffered the same fate of many artists who never realize the monetary value of their talent. But by remembering her and appreciating her work, her spirit and message survives in the beauty of her art. This article was researched through the Tropical Sun archives, Wikipedia, and Alan Schroeder’s book on Augusta Christine Savage, In Her Hands. I’ve always enjoyed her sculpture at the Norton Museum and never realized she had a local connection. Thanks for sharing this!